thedesignconcept has been busy creating, well, design concepts for innovative makerspaces within Nuneaton and Rugby libraries. Let’s Make – the branding for the new spaces – was created using a variety of materials including pegboard, pinboard, plywood and orientated strand board. “We wanted to promote the fact that the space is accessible in the widest possible sense and hopefully change their perception of what Makerspaces have to offer,” says the company. 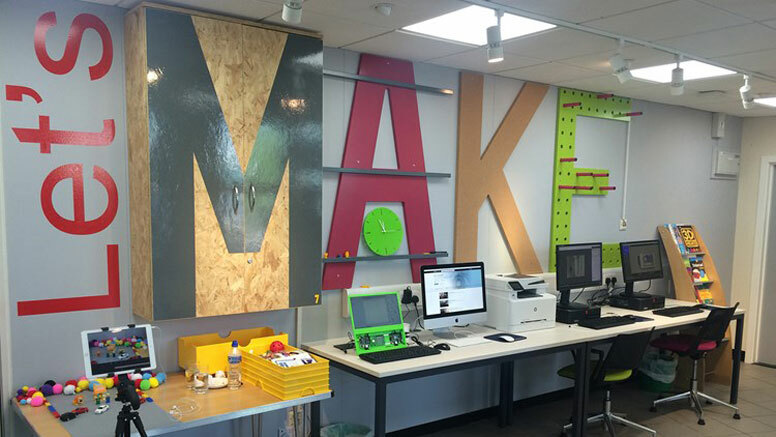 The makerspaces are places to learn, improve and build on new digital skills; to improve self-confidence and job prospects; a place to offer inspiring activities and to share new skills. These are vibrant, innovative and creative spaces, accessible in the widest sense of the word, user friendly with an attractive and engaging feel reflecting the specialised nature of some of the equipment and activities. The designed space promotes problem-solving, creative thinking, innovation and collaboration. The layout and designs are flexible, adaptable, welcoming, customer-friendly and approachable, fully compliant with all appropriate regulations and standards (DDA, fire, lighting levels etc.) and set within the context of a creative learning environment. Video presentation of the new spaces, with user and staff reactions.